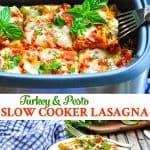 This Turkey and Pesto Slow Cooker Lasagna is a healthy version of your favorite Italian dinner recipe -- made easily in the Crock Pot! 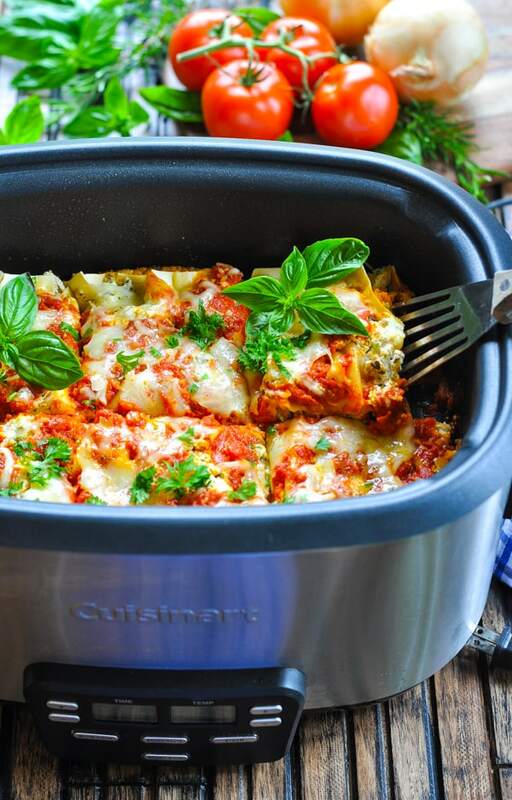 Did you know that you can make a delicious lasagna in your Crock Pot? 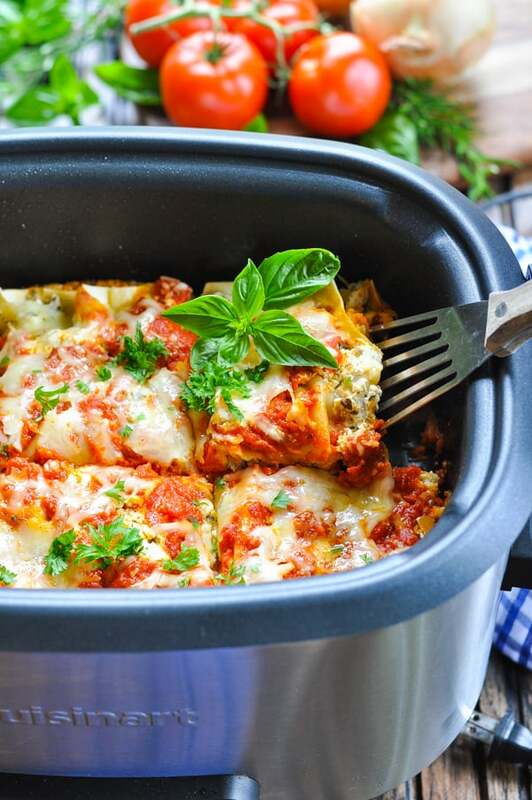 This Turkey and Pesto Slow Cooker Lasagna is a healthy version of your favorite Italian dinner recipe — made easily in the Crock Pot! I was definitely skeptical at first. 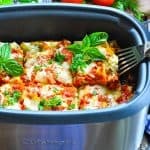 Would a Crock Pot lasagna have the same crusty, cheesy edges that I love on regular oven baked lasagna? Would the texture of the noodles be “normal”? The answer to these questions is “yes,” and my family agrees – this version is just as good as a traditional recipe. Plus, it just sits on your counter to cook for a few hours while you go about your business. Love that! First, let’s start with the meat sauce! 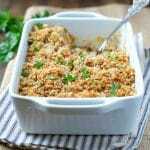 I use ground turkey breast in this recipe, but you can substitute with chicken for a chicken lasagna, or use ground beef or ground sausage if you prefer. 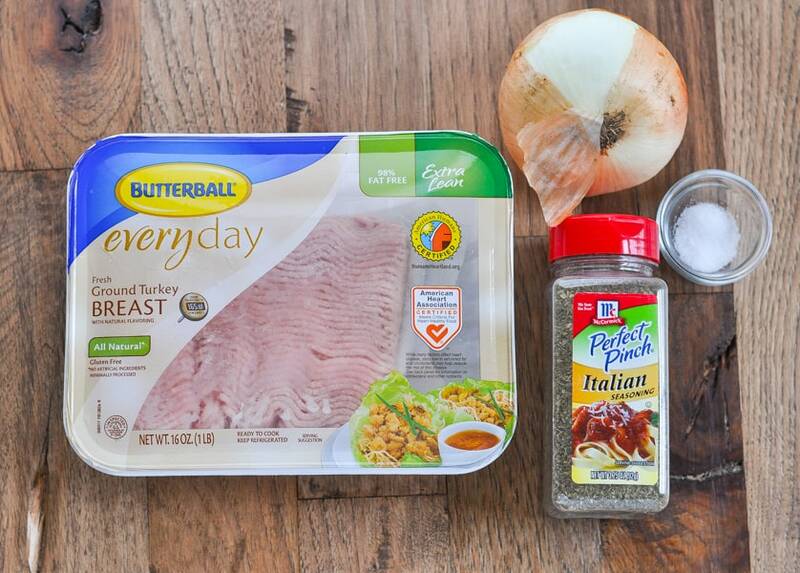 Cook the turkey in a skillet along with the diced onion, Italian seasoning, and salt. You can take care of this step in advance and just keep the meat refrigerated until you’re ready to assemble the lasagna in your slow cooker. 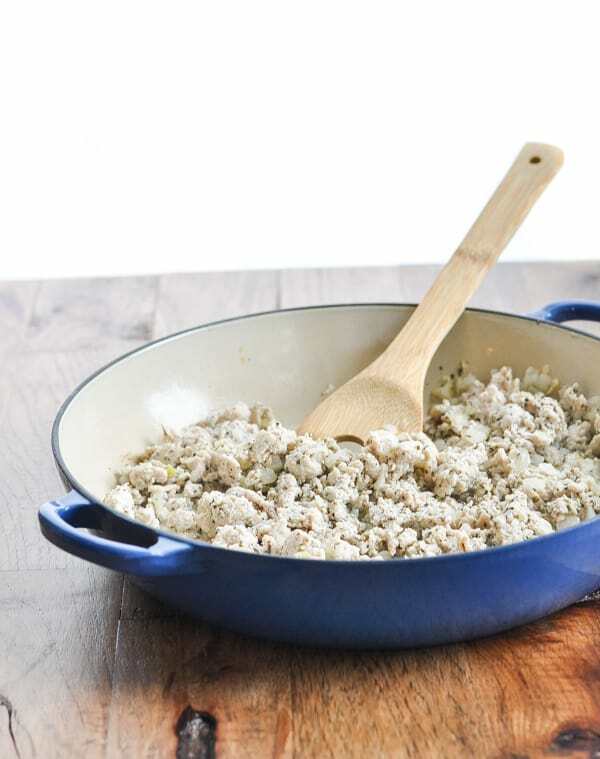 While the turkey browns, you can stir together your ricotta cheese mixture. This is where the pesto comes in! It just adds another layer of delicious Italian flavor (thanks to the basil and Parmesan cheese) to the dish. You can prepare the ricotta mixture in advance, too! Then, when you’re ready to start your Crock Pot, it’s just a matter of layering the ingredients as instructed below. 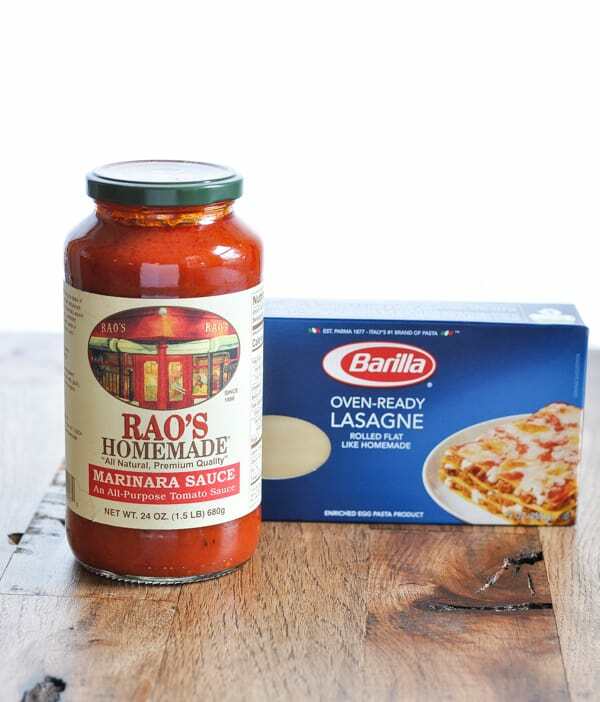 Make sure that you grab a box of “no boil” or “oven ready” lasagna noodles so that you don’t even have to boil them first! 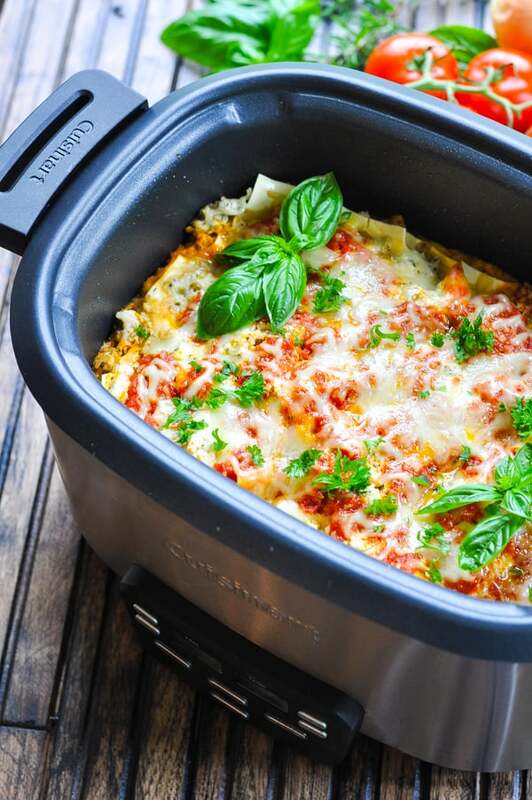 HOW LONG DO YOU COOK LASAGNA IN THE CROCK POT? 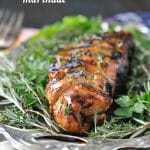 This recipe cooks perfectly in about 3 1/2 – 4 hours on LOW. If you want to cook on HIGH heat, I would suggest cooking for about 2 hours. Remember, all slow cookers run at slightly different temperatures, so you’ll just need to keep an eye on your dish the first time that you make it. You’ll know it ready when the noodles are tender and the cheese is melted and bubbly! I used ground turkey breast, but you can absolutely substitute with your favorite lasagna meat – ground beef, ground sausage, whatever! 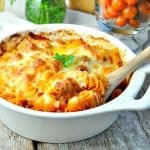 Make a CHICKEN LASAGNA using about 3 cups chopped rotisserie chicken or ground chicken instead of the turkey. Look for “oven ready” or “no boil” lasagna noodles so that you don’t have to pre-cook the noodles before they go into your slow cooker. Prepare the turkey and the ricotta mixture in advance and keep them refrigerated until you’re ready to assemble your lasagna. 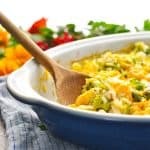 You can do this the night before or over the weekend, so that you only have to layer the ingredients in your slow cooker before turning it on. 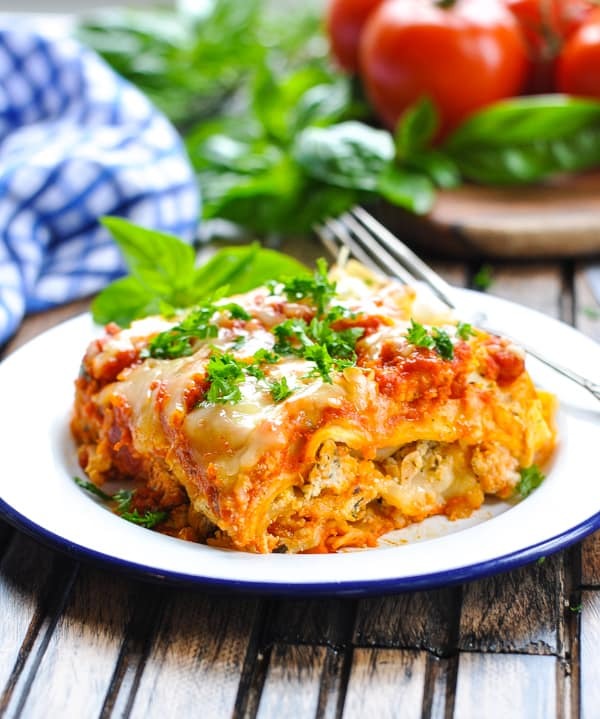 How to reheat leftover lasagna: if you have extra lasagna that you’d like to reheat for another meal, just place the lasagna in a baking dish, cover with foil, and bake at 350 degrees until heated through (about 20-30 minutes). In a large skillet over medium-high heat, cook turkey, onion, Italian seasoning, and salt until turkey is no longer pink. Drain. 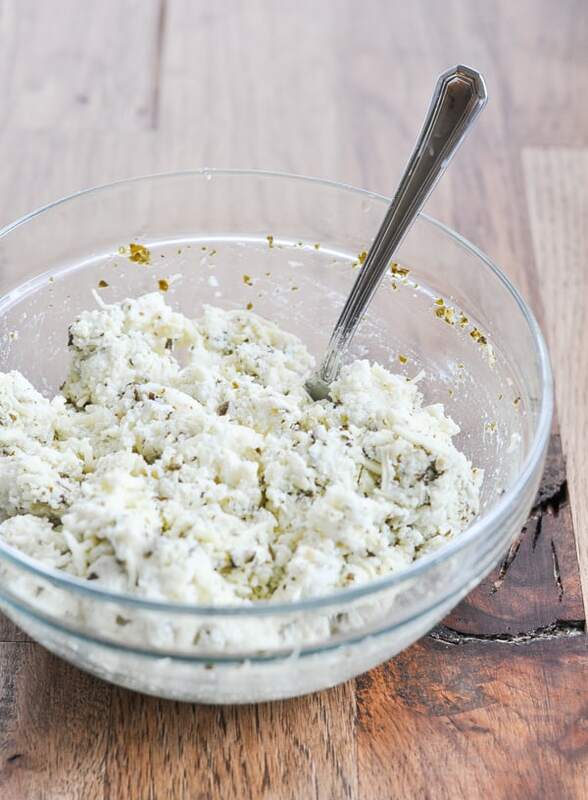 In a medium bowl, combine ricotta, pesto, and 1 cup of mozzarella cheese. Spray a 6-quart slow cooker with cooking spray. Spread about 1/3 of the marinara sauce onto bottom of the slow cooker. Place a layer of 3 lasagna noodles on top, breaking noodles as necessary to fit in cooker. Spread about 1/3 of ricotta cheese mixture on top of noodles. Then add 1/2 of turkey mixture on top. Drizzle with another 1/3 of the marinara sauce and then another layer of 3 noodles. Repeat with additional layer of 1/3 of the ricotta cheese mixture and 1/2 of the turkey. Top with remaining noodles, remaining ricotta cheese mixture, and remaining marinara. 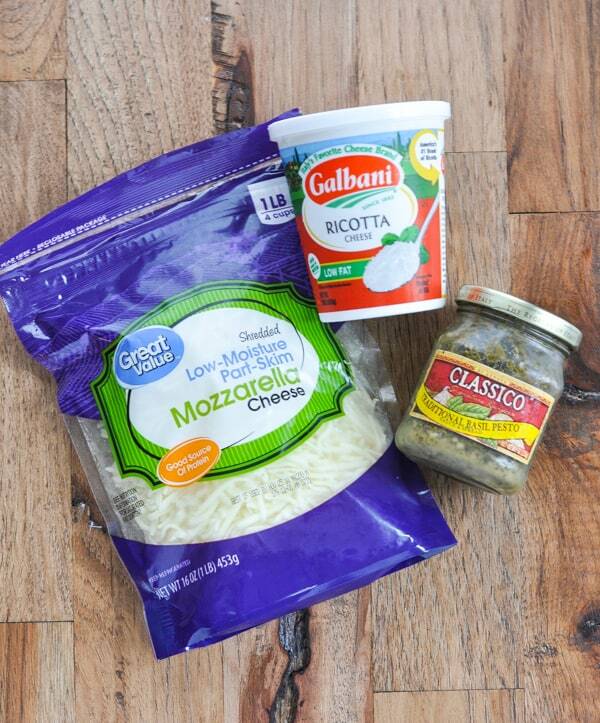 Sprinkle with remaining 1 cup mozzarella cheese. Cover and cook on LOW for 3-4 hours or on HIGH for about 2 hours. You know it's done when the noodles are tender and the cheese is melted! Remove lid and allow lasagna to cool slightly (for about 10-15 minutes) before slicing and serving. This will allow it to set so that it stays together nicely in squares! Look for "oven ready" or "no boil" lasagna noodles so that you don't have to pre-cook the noodles before they go into your slow cooker. Prepare the turkey and the ricotta mixture in advance and keep them refrigerated until you're ready to assemble your lasagna. 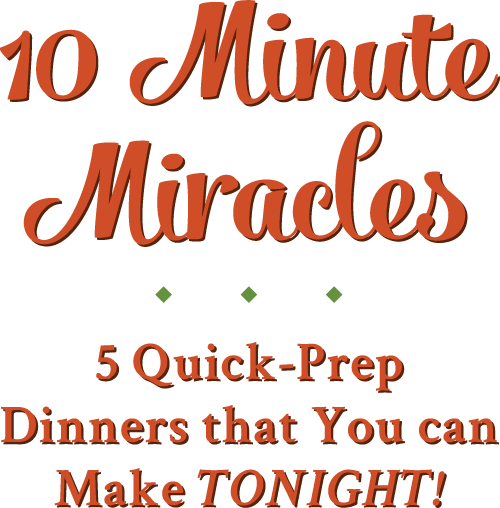 You can do this the night before or over the weekend, so that you only have to layer the ingredients in your slow cooker before turning it on. How to reheat leftover lasagna: if you have extra lasagna that you'd like to reheat for another meal, just place the lasagna in a baking dish, cover with foil, and bake at 350 degrees until heated through (about 20-30 minutes). 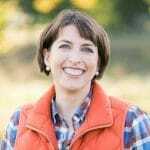 This post was originally published in February, 2013. It was updated in October, 2018. 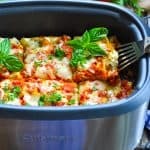 I have never made lasagna cooked in a crockpot! Interesting!! Thanks for sharing.